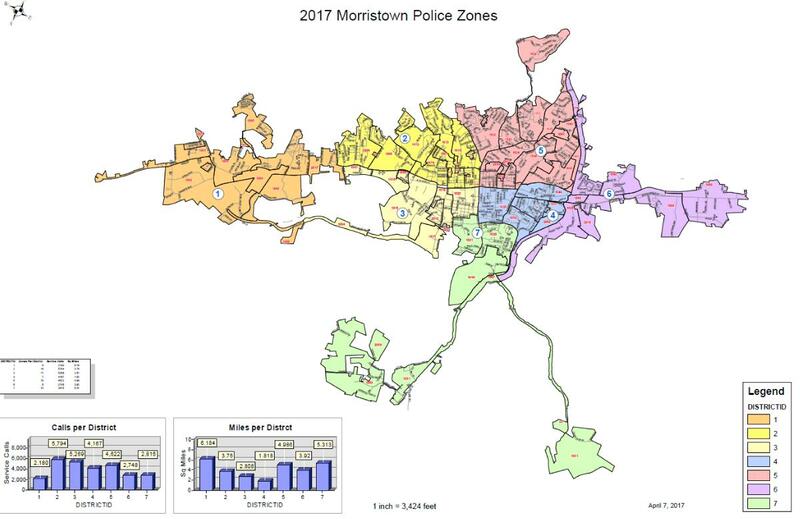 The Morristown Police Department has been researching ways to more efficiently serve the community. Beginning July 1, 2017, officers will now have seven patrol zones instead of six. The change is based upon city expansion and number of miles officers must drive to answer calls for service. Creating a zone reduces mileage officers have to drive; which in turn should reduce response times. Primary changes for zones occur in the south end of Morristown; from South Cumberland/Algonquin area to Exit 8 on Highway 25E and Exit 12 on Highway 160. Other zone boundaries were moved in order to provide efficient police services, as well. The MPD established a committee overseen by Operations Major Chris Wisecarver. The committee had a representative from each patrol shift, as well as Hamblen County Emergency 911 was also involved. The committee made the decision by looking at where an increase of calls for service were being generated and response times. The Morristown Police Department would like to express their gratitude to Hamblen County 911 Director Eric Carpenter for his help. Also, Ms. Debbie Lee, City of Morristown Geographical Information Systems Coordinator, for analyzing data and developing maps as the boundaries were rezoned.